Gold prices have risen 5% in the last six weeks, breaking $1,350 an ounce for the first time since June 2016. Money Morning Resource Specialist Peter Krauth says this recent rise is the beginning of a breakout for the precious metal, one that has massive profit potential for the individual investor. Peter's enthusiasm has given us our gold price prediction for 2018. According to Peter, gains of nearly 300% are on the table. "I think we'll see $1,400 this year and, eventually, $5,000 before this bull run is over," he says. 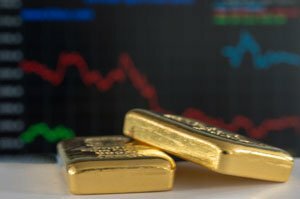 In fact, Peter sees three catalysts driving our gold price prediction in 2018 and beyond. Peter sees inflation as a key driver of rising gold prices this year. For the last six years, inflation has slowly increased, rising from 1.8% to 2.2% between 2015 and 2016. In November 2017, the core CPI inflation rate was 1.7%. The U.S. Federal Reserve is confident this figure will continue to grow, which is why it hiked interest rates last month. Historically, as inflation drives down the purchasing power of the U.S dollar, the rate of gold purchases increases. Taking advantage of a weaker dollar, international buyers purchase more of the precious metal, driving up the price of gold. This is why gold prices have risen in the last six weeks; as the dollar weakens, global buyers have jumped in and are buying gold "on sale." In an effort to keep inflation's rise in check, the Fed is likely to limit the amount of money in circulation by raising interest rates. What's in this book helped one reader make $185k in eight days… With the secrets you'll find in this book, Money Morning subscriber Jamie Newton made a $185,253 profit in just over a week! Click here to learn how you can claim your free copy today. Following a rate hike by the Fed, gold often sees robust gains. This trend can be traced back at least 30 years and was especially evident in the late 1970s and early 1980s. In 1980, the Fed raised interest rates to 20%. Shortly afterward, the price of gold hit a then-record high of $594 per ounce. The same kind of tandem movement is visible in the rate hikes the Fed has issued for the last three Decembers. Following each Fed rate hike in December 2015 and December 2016, gold prices rose over the course of the following year, spurred on by higher interest rates. In 2018, the Fed is expected to issue three additional rate hikes, one of which may even take interest rates above 2% for the first time since 2008.